Let Your Child’s Next Birthday Party be an ARTY Party! Select one of our party themes (or one of your own) and we will provide a super-fun themed PARTY CRAFT OR a GUIDED PAINTING for your child and his/her guests! Prices start at $60 for an Arty (theme-based) craft party (8 children). 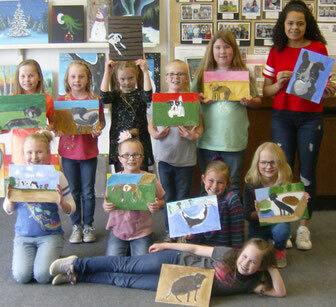 Guided canvas painting parties start at $15 per child/participant ($75 min.) depending upon size of canvas. Animals, Cowboys, Dinosaurs, Fairies, Frozen, Halloween, Hawaiian, Hello Kitty, Jungle, Mermaids, Minions, Ocean, Pirates, Princess, Snow, Space, Sports, Star Wars, Super Heroes, and Zoo. We can also do a Crazy - Inside Out - Upside Down - Backwards birthday party for your child! If your child chooses a painting party, he or she can select an 11" x 14" painting from our Kids' Painting Gallery OR a party theme from which we will design a fun 11" x 14" canvas painting. We must have at least two weeks prior to your party if a new painting design is requested. There is no extra charge for a new painting design, as long as the painting is for a child's birthday party and no larger than 11" x 14." A refrigerator is available for your ice cream and goodies, as well as a punch bowl. We have plenty of tables and chairs for art-making and a carpeted party area as well. In addition, the children's "Creation Station" art studio is open to your guests. To book a party, please call first to verify your preferred date and time. Download or pick up a Birthday Party Registration Form, complete, and mail or deliver to the BAC with your deposit. Also, please plan to come in for a tour sometime prior to your child’s party date.